2. Cholecystectomy usually laparoscopically or open performed by a general surgeon. At the department of surgery, University Medical Center and the University of Nevada School of Medicine in Las Vegas, the one step procedure has been adopted in selected cases by one surgeon since 1996 and some of these selected cases have been chosen to highlight the feasibility of this procedure. Obviously, the challenge of this procedure has been the performance of the ERCP in the supine position, but this center has shown that cannulation in the supine or slightly modified supine position resulted in 100% of successful cannulations as presented in an abstract at the 6th World Congress of Endoscopic Surgery in Rome, 1998. 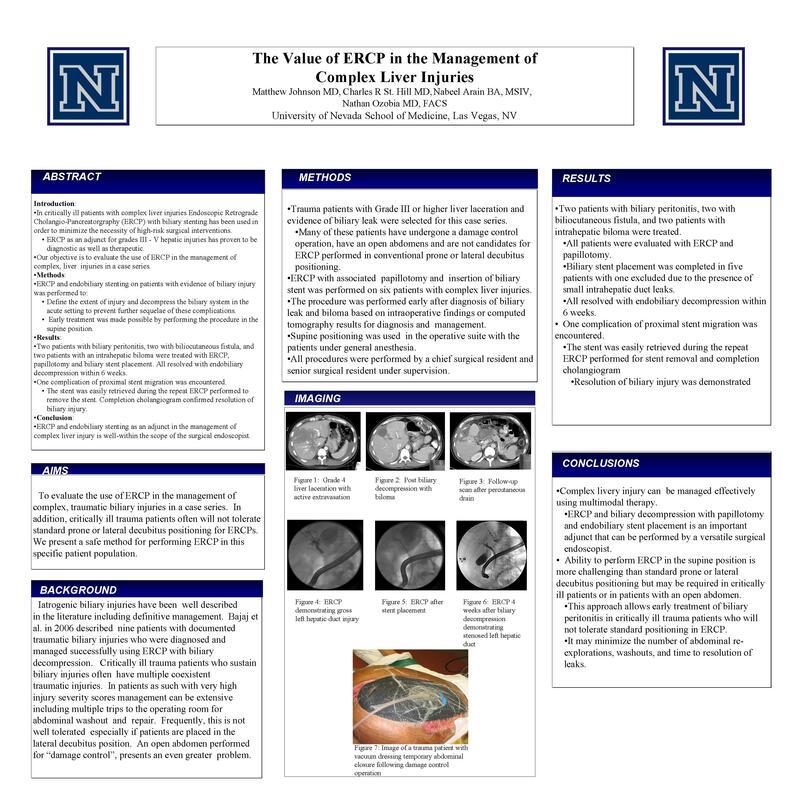 For this abstract, 10 cases have been completed so far with one unsuccessful cannulation. The successful cases had their ducts cleared of stones. Permit for laparoscopic cholecystectomy with operative cholangiogram possible open cholecystectomy. Intraoperative ERCP with papillotomy and balloon extraction of common bile duct stones; possible placement of biliary stent. Positioning is in the usual supine position for laparoscopic cholecystectomy, with the patient lying on a bean bag. Laparoscopic cholecystectomy with operative cholangiogram is always attempted. If the cholangiogram shows filling defects in the bile duct, the laparoscopic part of the procedure is completed and the ERCP performed. Results: Of the 10 cases done so far, successful cannulation was achieved in 9 cases. Selective cannulation was not achieved in one. Stones were found in the bile duct in 7 cases and successfully cleared. Sludge was retrieved in one case and in another case air bubbles were misdiagnosed as stones. 1. One step management of common bile duct stones is a feasible surgical procedure well within the scope of versatile surgical endoscopists. 2. Currently, a chief surgical resident and a senior resident are involved in this study and are performing most of the procedures under supervision. 3. This paper is not advocating the routine use of Intraoperative ERCP in uncomplicated laparoscopic or open cholecystectomies. 4. The prone or modified left lateral position remains the gold standard for performing ERCPs. The supine position is only advocated for use in the operating room under general anesthesia so the airway can be adequately protected. 5. There were no complications in this small number but as the number increases there is always potential for complications.